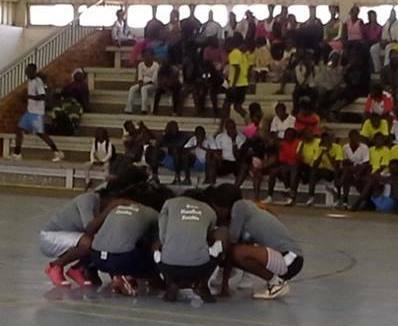 Giving Moral Support: We supported the Zambia Women’s Under 20 Handball Team at a friendly tournament they played against Zimbabwe at the Olympic Youth Development Centre. Catching Up: We shared our work and thoughts on gender issues in sport and the local context with our colleagues Ms. Diane Huffman of the Norwegian Olympic Committee, Brenda Matafwali of the Olympic Youth Development Centre and Mrs. Moyo President of the National Olympic Committee of Zambia. 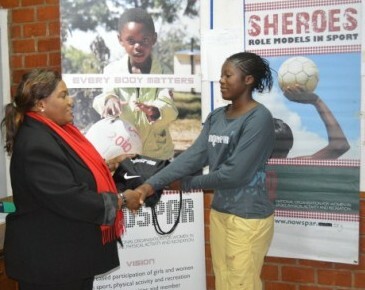 [05/07/13, Lusaka] The National Organization for Woman in Sport Physical Activity and Recreation (NOWSPAR) has donated Sports apparel to the Under 20 Handball Women’s National Team. 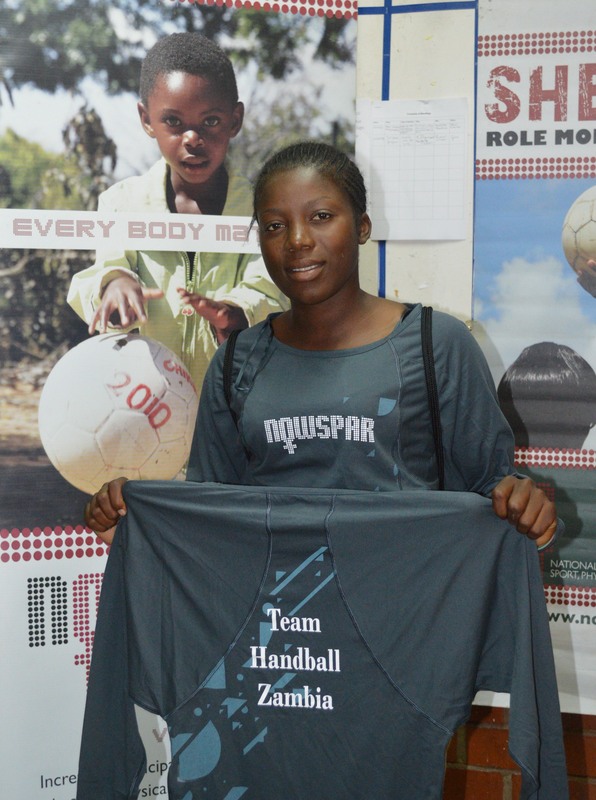 This is a contribution to support the Team in its preparation and participation in the Confederation of African Handball and the International Handball Federation Competitions for the upcoming Junior Olympics Qualifier matches and the Handball World Cup on 22 to 31 August 2013 in Congo Brazzaville. Once the team qualifies during the Junior Olympics Qualifer they will qualify to the Junior Olympics to be held in China, July 2014 and the Handball World Cup scheduled for Doha, Qatar in 2014. Receiving the equipment on behalf of the Team, National Team Player Royce Ngwira 17, a half winger, said ’We feel supported and that others have confidence in us. I think we will win and qualify for the World Cup’ Royce has been playing handball since 2007 in Mufulira. Presenting the items, NOWSPAR Executive Director pointed out that ‘Limited access to adequate and appropriate sport attire is one of the many hindrances to girls’ and women’s participation in physical activity and sport. It is both a practical and psychological barrier which is borne by families who in many cases are unable to prioritise this sort of expense when they have minimum incomes’ Matilda Mwaba said. 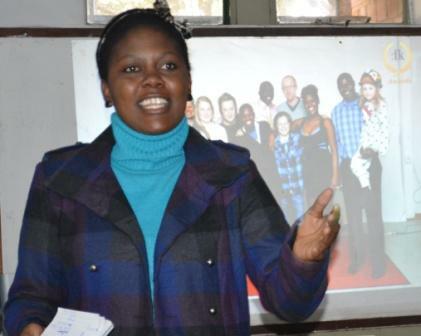 The young women in the Team such as Royce Ngwira, Christine Simwanza, Omar Mutale, Moriah Kamfwa and Janet Simwanza among others have worked hard and are not only a representation of athletic achievement, they are a symbol of young women who are crossing gender and cultural barriers to achieve their dreams. 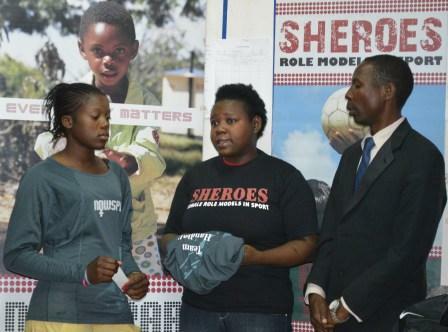 We recognise them as role models, they are ‘Sheroes’ in their community and in Zambia and we are positive that this is just part of the beginning of a vibrant sporting culture among women and men in Zambia. Mr. Banda encouraged the public and private stakeholders to continual supporting Handball, especially the teams for women as they are the most underfunded. We invite the general public to come and support us as we play a friendly game against Zimbabwe at the Olympic Youth Development Centre (OYDC) during a tournament tomorrow Saturday at 08:00 – 16:00 hours. HAZ is affiliated to NOWSPAR and is participating in a program to promote girls and women’s participation in Handball, reinforcing governance of the Association and addressing safeguarding and protection. NOWSPAR’s mission is to promote and encourage the participation of women in all areas and all levels of sport. The equipment and apparel presented was sourced through our partners Women Win and the Sport for Social Change Network in Southern Africa. Our programs are supported by our partners Norwegian Olympic Committee, Women Win, Zambian Governance Foundation, Government of Zambia Ministry of Education and Ministry of Sport. Join us in congratulating our Executive Director Ms. Matilda Mwaba on her election to the Board of the National Sports Council of Zambia (NSCZ). The NSCZ is the highest sport regulatory body in Zambia, established by an Act of Parliament to oversee, control, develop and regulate sport. 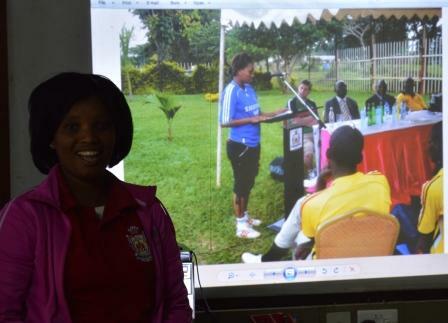 Her position on the Board is a strategic move to strengthen our influence and contribution to the development of sport in Zambia by providing advice, evidence and voice on gender issues in sport to the Council and its membership of 43 National Sport Governing bodies. 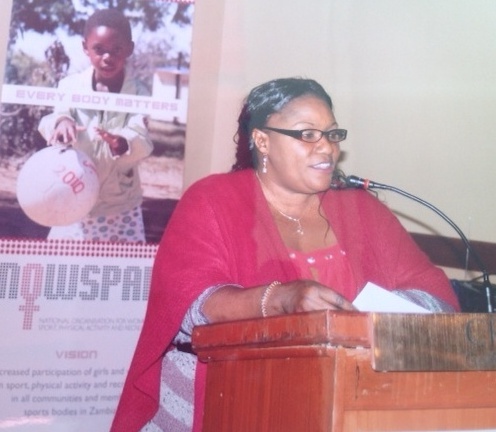 At regional level, Ms. Mwaba has been part of the Zone VI Women’s Committee by recommendation of the Ministry of Sport, being a part of the NSCZ strengthens her mandate and our opportunities for advocacy and lobbying as we endeavour to mobilise and influence the region and Africa as a whole to advance women in sport. 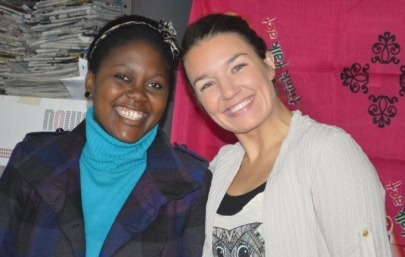 We look forward to an exciting journey and are optimistic of the impact that she will continue to have. Secondly, we congratulate Ms. Alison Diedre of the Horse Society of Zambia for her election to the NSCZ Board, Ms. Diedre is currently Vice President of the Horse Society and a member of the Women in Sport Leadership Network. Matilda and Alison are the only two females of the 7 elected members. More members including the Chairperson will be appointed in the next few weeks by the Minister of Sport. We look forward to the results of the appointments as we hope to have more women in this Board.